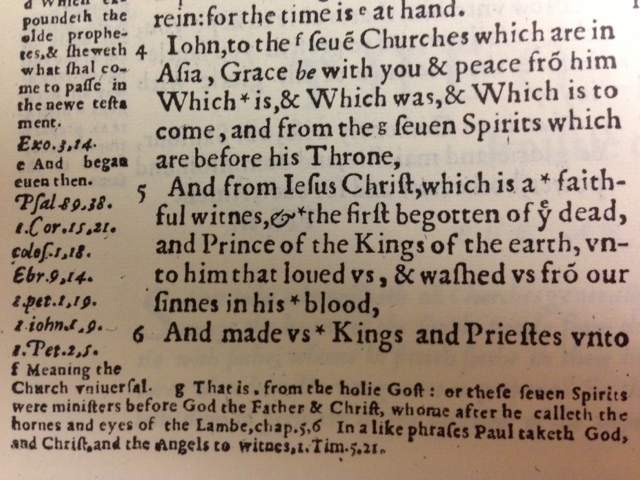 This image shows the beginning of “The Revelation of John the Diuine,” from the 1560 Geneva Bible. The Geneva Bible was the most widely read text in early modern England, being reproduced in pocket editions accessible for laypeople. The linking strategies in the Geneva Bible are fascinating. Asterisks were originally used in biblical translations to draw attention to a word that appears in one language, but not in another, for example, in the Septuagint but not Hebrew (Grafton and Williams 116). Interestingly, the asterisk’s usage is different in this case; the asterisks here indicate cross references, and correspond to the italicized verses in the margin. Occasionally a cross reference or alternate interpretation is provided with a double bar or pipe (||). The lettered footnotes are explanatory and exegetical, which is in keeping with other biblical footnotes (Sherman 77). Footnotes and marginal content were used extensively in the early stages of printing. The development of different types of systems that organize and signify different types of content is important. When only one type of footnote is used, the note itself has no semantic value. Here, the asterisk already implies a cross reference, at which point the reader can decide whether or not to look at it. The Geneva Bible was criticized for its commentary, which interprets the text with a particularly Protestant lens that can be overt. This interpretive aspect of the Geneva Bible makes it a rich resource of Protestant ideology at the time of the Geneva Bible’s printing. The same conventions are continued in the 1611 Authorized Version, which also uses asterisks and lettered footnotes, but there the marginal commentary is much more restrained. The Geneva Bible: a Facsimile of the 1560 Edition. Ed. Loyd E. Berry and William Wittingham. Madison, WI: University of Wisconsin Press, 1969. Print. Grafton, Anthony, and Megan Williams. Christianity and the Transformation of the Book: Origen, Eusebius, and the Library of Caesarea. Cambridge, MA: Harvard University Press, 2006. Print. Sherman, William H. Used Books: Marking Readers in Renaissance England. Philadelphia: University of Pennsylvania Press, 2008. Print. We like the concept of technological revolution: it replaces the cluttered complexities of history with illusions of dramatic simplicity. We’re supposed to be living in a digital revolution right now, and it’s been compared to previous significant developments in the history of information and communication technologies: the invention of printing or of writing, for example. It is possible to argue, however, that the closest historical precedent for a shift from books to screens is the adoption of the codex in the first few centuries of the Christian era (see Chartier, quoted in Frost 1998). The reasons for the shift from scroll to codex are still a matter of discussion, but it is a common claim that the codex replaced the scroll, implying that people in late antiquity stopped producing and reading scrolls, and started producing and reading codices. There you have a revolution, apparently: a new technology (for reasons of efficiency, politics, culture, usability, whatever) renders an old technology obsolete. But it wasn’t that simple. To be sure, the Middle Ages represent centuries of experimenting with, developing, discovering the potential of the codex. But medieval people used scrolls and rolls, too. (By the way, although the two terms can be interchangeable, it is useful to distinguish between a scroll, which is opened horizontally, and a roll, which is opened vertically.) In England, in particular, rolls were used for legal, financial, and government records from the 12th to the 19th centuries. Other types of text, particularly genealogies, were also written on scrolls or rolls. Richard Rouse argued in 1982 that rolls may have been a common format for lyrics or similar texts intended for performance, although hardly any examples survive. 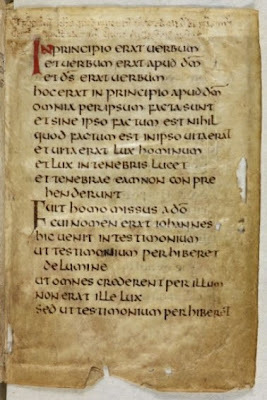 The only surviving roll containing a medieval literary text in English is British Library MS Additional 23986, which has the short English play Interludium de clerico et puella on one side and an Anglo-French political poem on the other. I use the present tense hopefully; the manuscript seems to have disappeared from the British Museum in 1971. Why did people use scrolls and especially rolls in medieval England? What kinds of texts were they associated with? How did the physical form of scrolls and rolls affect the ways in which they were read? 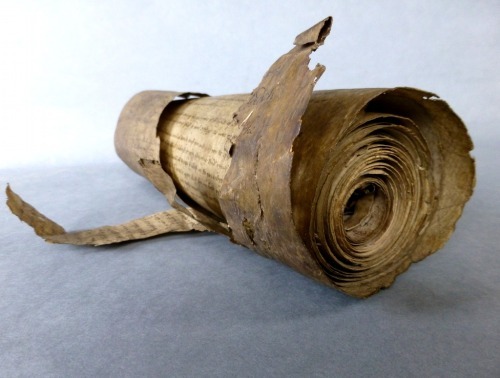 Why did the use of scrolls and rolls persist so stubbornly for certain kinds of texts? In digital reading environments, it is common not to flip pages (nostalgic turning-the-pages animations notwithstanding) but to ‘scroll’ up and down; you probably did that to get to what you're reading now. Why do designers of these interfaces choose scrolling (or rolling) rather than other ways of moving the reader through text? How does scrolling on a screen differ from the experience of unrolling a medieval manuscript? One possibility raised by these questions is that scrolls and rolls present textual information in a linear, ‘flattened’, and (at most) two-dimensional format. This may be one reason why they seem to have been associated with public and/or spoken (or sung) texts. A scroll lays it all out if you choose to unroll it completely; the codex hides everything except the opening you are looking at. We’ll have to think a little harder about how scrolling up and down on a screen provides a reading experience that’s different from either of these. Cavallo, Guglielmo. ‘Between Volumen and Codex: Reading in the Roman World.’ In A History of Reading in the West. Ed. Guglielmo Cavallo and Roger Chartier. Trans Lydia G. Cochrane. Amherst: U of Massachusetts P, 1999. 64-89. Clanchy, M. T. From Memory to Written Record. 3rd ed. Wiley, 2012. Clemens, Raymond, and Timothy Graham. Introduction to Manuscript Studies. Ithaca: Cornell UP, 2007. Frost, Gary. ‘Adoption of the Codex Book: Parable of a New Reading Mode.’ Book and Paper Annual 17 (1998). Paden, William D. ‘Lyrics on Rolls.’ In ‘Li Premerains Vers.’ Ed. Catherine M. Jones and Logan E. Whalen. Rodopi, 2011. 325-340. Roberts, Colin H., and T. C. Skeat. The Birth of the Codex. London: Oxford UP, 1983. Rouse, Richard H. ‘Roll and Codex: The Transmission of the Works of Reinmar von Zweter.’ Münchener Beiträge zur Mediävistik und Renaissance-Forschung 32 (1982): 107-123. Rpt. in Mary A. Rouse and Richard H. Rouse, Authentic Witnesses: Approaches to Medieval Texts and Manuscripts. Notre Dame: U of Notre Dame P, 1991. 13-29. Steiner, Emily. Documentary Culture and the Making of Medieval English Literature. Cambridge: Cambridge UP, 2003. Taylor, Andrew. ‘The Myth of the Minstrel Manuscript.’ Speculum 66.1 (1991): 43-73.